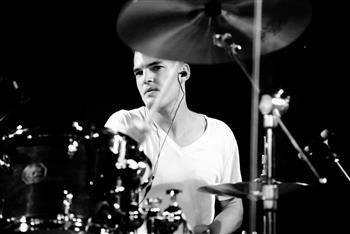 Tripp Beam began playing drums at age 12. Originally introduced to music by way of the piano, Tripp's interests took a turn after 5 years of studying to pursue the drum set. His high school years were active in the jazz, marching and concert bands as well as performing in local groups in North Carolina anywhere he could. Upon graduation from the Hayes School of Music of Appalachian State University, Tripp settled in Los Angeles. In 2012 he was the drummer for the sold out Evening with Paul Williams / Phantom of the Paradise concert held in L.A. Paul Williams is an Oscar, Grammy and Golden Globe winning Hall of Fame songwriter and the current president and chairman of ASCAP. Tripp has been Moby's drummer of choice since 2013, supporting the Innocents, These Systems Are Failing, More Fast Songs About the Apocalypse, and the Everything Was Beautiful and Nothing Hurt releases. In addition to his continued work with Moby, Tripp has worked with an array of artists in the studio and/or live including Linda Perry, Grace Mitchell, Korey Dane, Heather Porcaro, Brooke Waggoner, Gold Star, Ran Jackson, Blonde Summer, Aimee Osbourne, Psychic Friend, Nick Waterhouse, Odessa, Julie Mintz, Rose Falcon, Dan Bern and many others.